Dr. Moriel Ram is a Research Associate in the Development and Planning Unit at the University College London. The Golan Heights is an elevated plateau stretching across some 932 square miles that shares a border with Lebanon, Syria, and Jordan. Several Jewish communities unsuccessfully tried to settle in the southern parts of the region and during the late Nineteenth Century the pre-independence Zionist movement claimed this area in the post-World War I Peace Conference of 1919. Rather than emphasising a historical connection to the area, the movement’s leaders chose to stress its strategic importance as a barrier from invading forces from the east (citing Bedouin tribes as the main threat) and a site for reliable irrigation sourcesfor a potential Zionist polity. With the creation of a mandate system in the early 1920s the area was eventually placed under French custodianship and became part of Syria with its establishment in 1946. Following the 1948 War, Israel and Syria battled over border delineation, diversion schemes for the Jordan River, and control of the Sea of Galilee. Artillery fire, infantry raids, and aerial dogfights became routine along the border during the 1960s causing considerable casualties and widespread destruction of property. The Golan became heavily militarised and was riddled with bunkers, minefields, and outposts. At the same time, it was also a bustling province with a population that in 1967 reached almost 150,000 civilians who lived in 270 villages and towns. The populations’ majority (85%) were Arab Sunni Muslims and the rest belonged to a variety of ethnic groups such as Cherkassy, Turkmen, Maronite Christians, Bedouin, Alawites, Isma’ilis, and Druze. Despite the area’s civilian life, the Syrian Plateau came to represent a threat to Israeli Jews. Significant pressure came from residents of the Kibbutzim (small agricultural communities) in northern Israel which at the time held significant political power. They demanded that the “Syrian plateau”, as it was colloquially known then, be pacified. Syria played a minor part during the June 1967 war, but Israeli leaders decided that Syria’s involvement in the run-up to the war provided a pretext to occupy the Golan. The Golan’s occupation thus became part of an expansion strategy propelled by the perception (real or constructed) that Syria would continue to use the Golan to launch artillery attackson Israeli settlements. This fear-fuelled geopolitical “Israelification” of the Golan was enacted through three main tactics. First, the Israeli military displaced the Syrian population who remained in the territory after the fighting and prevented the return of civilians who fled during the war. Only 6,500 people from the Druze sect that was historically considered “loyal” to Israel were permitted to remain. The rest were either forced to leave or were not allowed to return to their homes. Second, the Israel military, with supervision by archaeologists, architects, and rural planners systematically demolished villages, farms and houses. All structures were to be demolished except for those with architectural, archaeological or aesthetic significance. In 1981 Israel extended its authority of civilian law to the Golan Heights, a move regarded as de-facto annexation. The decision was part of the attempt to secure Israel’s territorial conquest of June 1967 while then prime minister, Menachem Begin, was about to give back the Sinai Peninsula to Egypt as part of the Peace agreement between the two countries.The extension of civilian law to the Golan was a political decision made to garner support for Begin from the Israeli right who fumed over the withdrawl from Sinai. Similarly, Trump’s decision to recognize Israeli sovereignty over the Golan is an attempt to bolster Benjamin Netanyahu who is facing an uphill electoral battle in the coming elections in April. Both in 1981 and now, the pledge to the Golan was intricately connected to popularity contests and not to overall confidence of Israel’s leaders about the unquestioned “Israeliness” of the Golan. 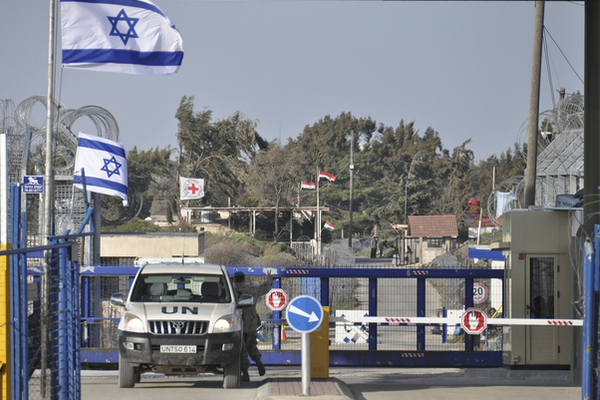 Indeed, Israeli policymakers have refrained from admitting that the Golan was officially annexed and from the 1990s up to the breakout of civil war in Syria in 2011, probed the possibility of giving back the territory. Thus, when Prime Minister Netanyahu lauds President Trump for recognising Israel’s sovereignty over the Golan, it goes against Israel’s strategy of leaving the question of the Golan’s formal status shrouded in opacity. Of course, the general sentiment that the Golan is supposedly part of Israel predates Trump’s recognition. Jon Stewart’s The Daily Show is a case in point to this ignorance. A segment covering Israel’s 2014 military campaign in Gaza presented a map which did not encompass the Palestinian West Bank and Gaza Strip but depicted the Golan Heights as an integral part of Israel. The fact that Stewart’s team chose this map is, however, hardly coincidental, since many existing maps have erased the line separating the Golan. Can we blame Donald Trump, if even Jon Stewart “recognises” Israel’s control of the Golan? Nonetheless, Trump’s recognition should have generated more attention than it got, especially because of his earlier decision to recognise Jerusalem as Israel’s capital triggered violent protests and worldwide condemnations. Unlike Jerusalem, the connection of the Golan to Zionism’s historical and theological narratives is peripheral at best and never played a dominant part in the reasons for controlling it. Besides, the area was never part of Mandatory Palestine and was internationally recognised, including by Israel, as part of Syria. Much more than Jerusalem, the Golan represents a clear case of a territory belonging to one sovereign state that is illegally occupied by another in clear violation of international law. So, what does the relative quiet with which Trump’s recognition has been accepted demonstrate? The silence can be attributed to the announcement’s timing as it coincided with (another) violent escalation between Israel and Gaza and, perhaps more critical, the headline grabbing Muller Report’s completion. The brazen flaunting of International law also utilised the tragedy of the Syrian civil war as cover. There is almost no one left in Syria to challenge Israel’s claim to the Golan (although we can be sure that Putin and Iran weren’t too pleased). At the same time, any Israeli policymaker who will openly support an attempt to cede the Golan risks being branded as a lunatic. Fear mongering has always been a potent political currency in Israel, and the notion of Isis or Hezbollah taking over in Israel’s absence has significant public gravity. But as much as Israelis would like to claim that the Golan is needed for its strategic value or for its bucolic scenery, it cannot change the fact that there is no legal case for annexing the territory. Security threats cannot serve as a legitimate reason for annexing territory of another nation. The position of some legal experts that the territory rightfully belongs to Israel since it was occupied as an act of self-defence stands on shaky ground. It was Israel who invaded Syria which, until the moment of the incursion, did not play a significant part in the actual fighting of the June 1967 war. Even more so, a new historiography of the June war suggests that Israel's decision to take over the Golan was part of a strategy developed years before the actual occupation. Trump decision is simply another validation of one of the most successful land grabs of the twentieth century that is based on displacement, demolition and paradoxical transformation of the Golan into a peaceful warzone. A piece of “Europeansque” tranquillity in the heart of the Middle East’s most volatile region. And this brings us to the question of what we can learn from the past for the future of the Israeli-Palestinian conflict. Some have suggested that Trump’s move, is, in fact, a way to sweeten the bitter pills that Israel will have to swallow once his ostensible “deal of the century” will be published. Trump, so the rumor goes, will force Netanyahu, or whoever will be Israel’s Prime Minister, to accept a Palestinian state, to relinquish land and evacuate settlers. But so far Trump, like the Golan, has proved to be more Israeli than Israel itself. The re-imposing of sanctions on Iran and the recognition of Jerusalem points to his complete lack of reservations about realising Israel’s wildest dream which now might become even wilder. This is especially true since the Golan is already developing into a generic model for what the West Bank should “become.” Put differently, the Israelification of the Golan which entailed massive population displacement, spatial demolition and European rebranding, has now become a battle-tested template to how annexation could look like in the West Bank. Yet we should also note that Trump’s blatant flaunting of international law in Iran, Jerusalem, and now the Golan is working at the moment but might also indicate America’s weakening position as it no longer can claim to lead an international community who opposes the notion that military might should translate into political rights. When Britain and France tried to take over the Suez Canal in 1956, a scheme that also involved Israel’s active participation and occupation of the Sinai Peninsula, they were forced by a new world order to back down, ending their time as colonial empires. While it is hard to draw immediate comparisons, Trump’s move might put America on the same path. In other words, Trump’s Golan might eventually become America’s Suez.